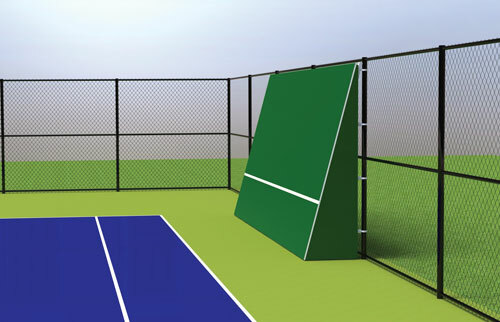 Vertical Backboard: Vertical backboards are the most widely used type of backboard. They provide an ideal way to improve your strokes and likewise provide an outstanding aerobic workout. A vertical backboard encroaches only 4-6 inches inside the court fence. Rally Master also manufactures back-sloped backboards. 8 Degree Back-sloped Backboard: An 8-degree back-sloped backboard provides a slightly lofted ball return that will land further away from the board compared to the flatter, shorter rebound off a flat wall. Some players and coaches prefer the lofted return because it allows more time to prepare for the shot and places the player further from the practice wall. It should be noted that other manufacturers sell backboards with 15 degrees of back-slope. Rally Master believes 15 degrees of back-slope creates an unrealistic, extremely “high-lofted” ball return that is unsuitable for all but beginner players. This high-loft is especially counter-productive when a player performs volley drills close to the board. Rally Master’s 8 Degree back-sloped, backboard provides the best all around performance in all types of drills regardless of skill level. An added benefit is the fact that our 8 degree backboard only encroaches approximately 21″ inside the fence compared to the approximate 30″ of a 15 degree back sloped board. 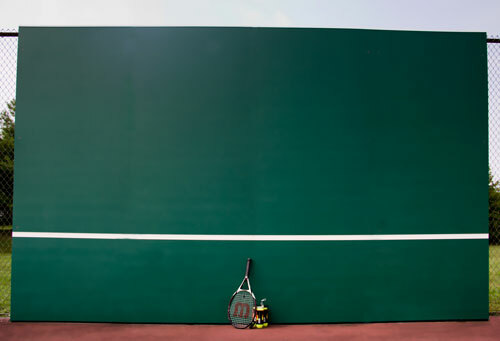 Winifred McLean, Oval Tennis, Inc.